Today at Aruba Atmosphere in Ŝibenik Aruba Networks announced a brand new Access Point: the AP387. As numbers are not totally speaking for them self, let me say it with words. The AP387 is a point-to-point outdoor AP with two radios; one 5GHz radio and one 60GHz radio. 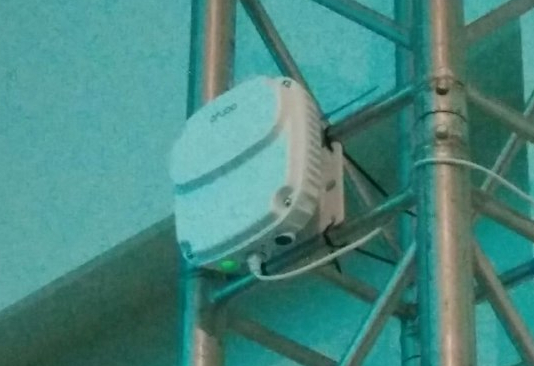 It’s a totally new area for Aruba, as they’ve never build an AP on such high frequencies. Before I get into the technical details of 802.11ad, I will give you some specs the APs has, how it looks and why. The AP is PoE-powered with 802.3at, because 60GHz is consuming lots of power, we’ll get to the „why“ later. The AP has an estimated throughput of 1GBit/s over the air. As we all know those numbers aren’t always correct, but in this case they are assuring this throughput for up to 500m distance. But how does this actually work? As mentioned, the AP has two radios. The first radio is a normal 5GHz 802.11ac radio with 2×2 MIMO and two stacked antennas per stream. 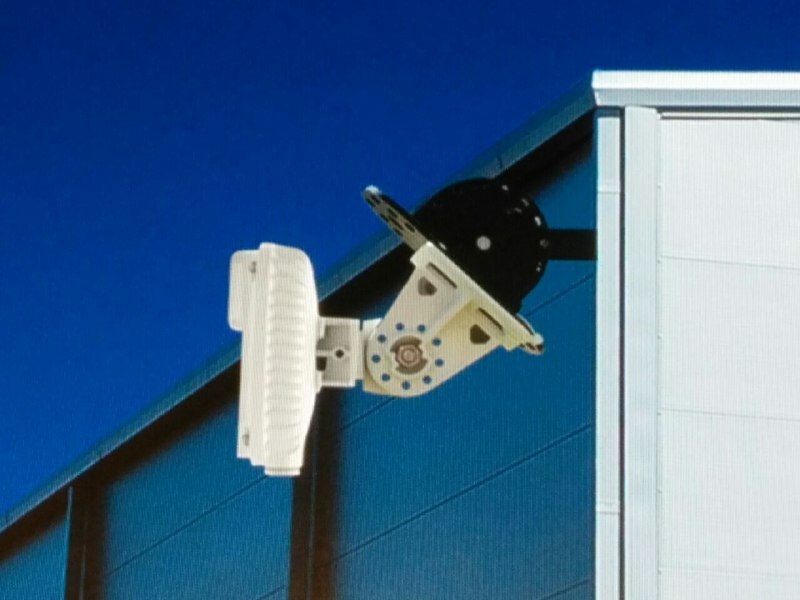 The opening angle of this antenna is about 90°x40° (width x height), the second radio is using 60GHz and 802.11ad to connect to the opposite site. As the throughput of the 5GHz radio is only somewhere at 300MBit/s it is coupled with the 60GHz radio to reach the throughput. Right now there is only a point-to-point solution available, also due to the small opening angle of the antennas. 802.11ad, also known as WiGig, is a 60GHz technology which is actually been here since 2013, its the brother of 802.11ac. It has four channels in europe and three channels in USA/Canada. The nominal channel bandwidth is at 2.16GHz, which enables it to have this high throughputs. The highest modulation is only 64QAM, but we need this in this band. 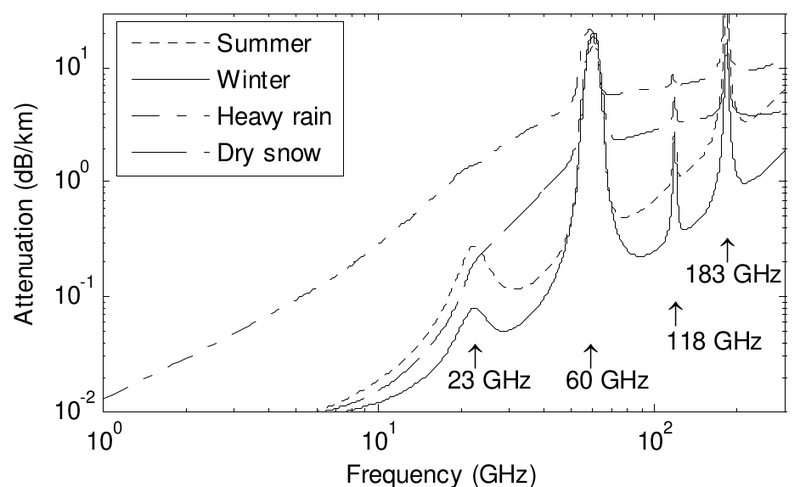 Roughly you can say, that you experience about 90dB of attenuation over a distance of 10m. The reason for this is that oxygen is resonating at this frequency and consumes all the energy. But how is it possible to create a 500m link with this high attenuation? It’s easy, the word is phase shifted array. This is a electrical controllable directional antenna, which really makes a difference in the received signals SNR and also in setting up the AP. You don’t really need to make sure the two APs on both sides are aligned perfectly, the antennas will automatically adjust themselves to make the connection perfect. The 60GHz antenna has a scan-range of +/-40° to the side and +/- 12° in height. This is the range the AP uses to adjust its 60GHz antennas. Also the chipset permanently checks the connection and re-adjusts it, if something like wind moves the AP a bit. In the last days I got some questions that I now want to answer. The first question was, wether you need a license or some registration to use the 60GHz band. In some bands you need those licenses, but not with 60GHz. As it’s the „oxygen-frequency“ there aren’t that kind of limitations. As you can see there is a slightly thicker part on the upper part of the AP – this is where the 5GHz antennas are. The APs radome is designed this way on purpose. The thicker part acts as a small roof in order to make sure there is no water running directly down the AP in front of the 60GHz antenna. Of cause the 60GHz link will fail due to the water in the air, but at this point the 5GHz radio will still deliver 300Mbit/s of throughput. Summed up, this AP is a totally new area for aruba, but I think they are on a good track with it. Maybe the AP will become point-to-multi-point, but I can’t confirm that. I don’t really know what the future holds, I can only speculate, but in the future 60GHz will hopefully play a bigger role, not only in outdoor, but also for indoor APs.